Amy’s bolognese post is a tough act to follow… especially after meeting it in person on Tuesday evening, man that is GOOD. 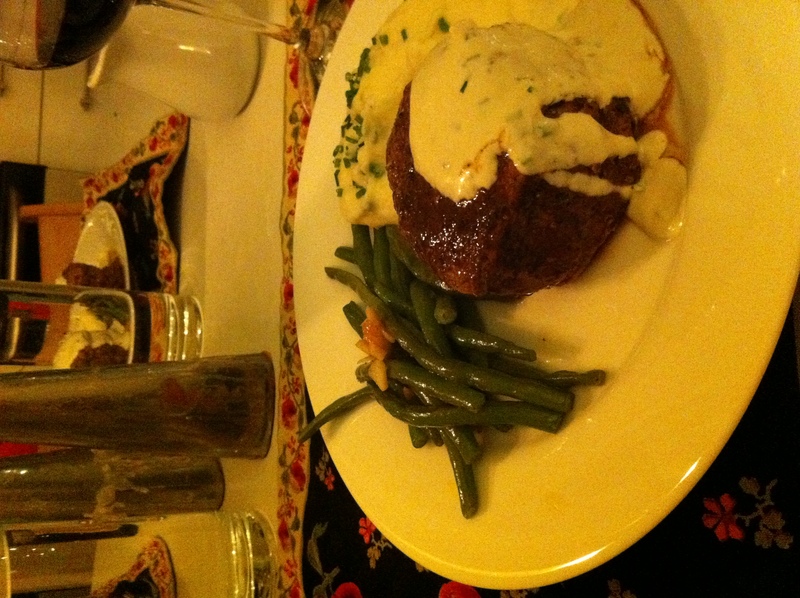 But seriously, what could be better than a delicious steak covered in cheesy cream sauce? Few things. I actually made these steaks last Thursday for a romantic candlelit supper with a special someone… (*cough* Amy Samuel *cough*), and I’m only now getting my act together and posting, so tragic. I also skimped on the pictures this time around as Amy mentioned, we were just far too focused on chatting with our dinner guests to snap many. So without further ado, my take on Ina Garten’s Steakhouse Steaks. Preheat your oven to 400 degrees and heat up cast iron pan over high heat for about 5 minutes or so. Dry the steaks, brush them lightly with oil, and then season with salt and pepper. 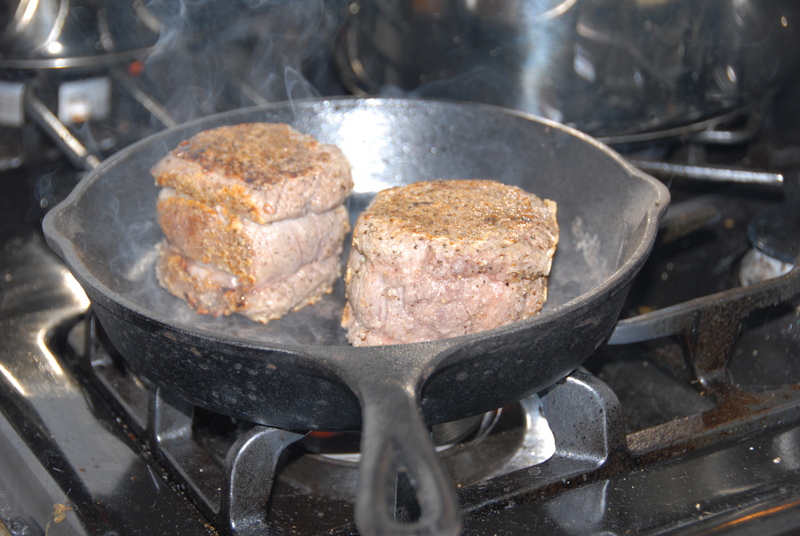 Sear them on all sides for 2 minutes per side, for a total of about 10 minutes. Then put a tablespoon of butter on top of each steak, and put them in the oven for about 10-12 minutes for medium rare. Cover them in foil, and allow them to rest for 10 minutes before serving. MEANWHILE, you should have already started on the delicious Roquefort chive sauce since it takes QUITE some time. Bring the heavy cream to a boil over medium heat, then continue cooking it at a low boil for about 20 minutes, until it thickens. Off the heat add the remaining ingredients and whisk thoroughly until combined. And to accompany the delicious steak & sauce, I made some sour cream mashed potatoes, and sauteed haricots verts with garlic. Overall a smashing dinner with lovely company! This entry was posted in Beef and tagged Barefoot Contessa, dinner, haricots verts, Ina Garten, mashed potatoes, roquefort chive sauce, steak. Bookmark the permalink.